It is that time of year again!!! 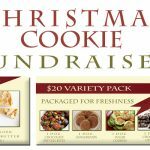 If you are looking for a great gift item for neighbours or just don’t have the time to bake; then Countryside Camp is pleased offer you a choice of 4 dozen Christmas Cookies packaged and boxed for freshness for $20 each and we will be offering 8″ Boterkoek (almond butter cake) packaged for freshness for $10 each. Orders will be taken on-line before November 14th. Please pick up your order at Countryside Camp in the main office building on Dec 3rd, 10am-5pm. Your order can be paid for by cheque, cash, debit, Visa, or Mastercard at pickup.